Jeep Wrangler (YJ) (1987-1990) w/ 4.2L engine; w/ Rear Inlet Fitting. Jeep Wrangler (YJ) (1987-1990) w/ 4.2L engine; Severe Use; Export only. Jeep CJ (1983-1986) w/ 2.5L AMC engine. Jeep CJ (1977-1978) w/ 3.8L engine. Jeep CJ-5 (1977-1983) w/ 4.2L engine; w/ 2 Barrel Carburetor. Jeep CJ-7 (1977-1986) w/ 4.2L engine; w/ 2 Barrel Carburetor. Jeep SJ & J-Series (1977-1986) w/ 4.2L engine; w/ 2 Barrel Carburetor. Fuel Sending Unit O-Ring for J5357373 and J5362090. It would have been more than 20 years since that kit was even sold so It might not have been manufactured for even longer . A Rare item for the elite restorer. Jeep CJ-5 (1980-1983) w/ 4.2L or 5.0L engine; w/ A999 Automatic Transmission. Jeep CJ-7 (1980-1986) w/ 4.2L or 5.0L engine; w/ A999 Automatic Transmission. Jeep CJ-8 (1981-1986) w/ 4.2L or 5.0L engine; w/ A999 Automatic Transmission. Jeep SJ & J-Series (1981-1983) w/ 4.2L engine; w/ A904 or A999 Automatic Transmission. Jeep Wrangler (YJ) (1987) w/ 4.2L engine; w/ A999 Automatic Transmission. Jeep Wrangler (TJ) (1997-2006) w/ 4.0L engine. Jeep Wrangler (YJ) (1991-1995) w/ 4.0L engine. Jeep Wrangler (YJ) (1987-1990) w/ 4.2L engine. Jeep Comanche (MJ) (1987-1992) w/ 4.0L engine. Jeep CJ-5 (1972-1978) w/ 3.8L engine. Jeep CJ-6 (1972-1975) w/ 3.8L engine. Jeep CJ-7 (1976-1978) w/ 3.8L engine. Jeep CJ-5 (1972-1983) w/ 4.2L engine. Jeep CJ-6 (1972-1975) w/ 4.2L engine. Jeep CJ-7 (1976-1986) w/ 4.2L engine. Jeep CJ-5 (1971-1981) w/ 5.0L engine. Jeep CJ-6 (1971-1975) w/ 5.0L engine. Jeep CJ-7 (1976-1981) w/ 5.0L engine. Jeep C104 Commando (1972-1973) w/ 4.2L or 5.0L engine. Jeep SJ & J-Series (1972-1979) w/ 3.8L engine. Jeep SJ & J-Series (1972-1986) w/ 4.2L engine. Jeep SJ & J-Series (1970-1986) w/ 5.9L engine. Jeep SJ & J-Series (1971-1979) w/ 6.6L engine. Flywheel Ring Gear; 164 Teeth. Crown Automotive #83300111 Brake Master Cylinder Jeep CJ (1978-1986) with Power Brakes. With over 9,000 different parts in stock for Jeep® vehicles from 1942 on up, Crown has the largest stock of replacement parts for Jeep® vehicles, including factory-discontinued parts. In fact, many of the older Jeeps are still on (and off) the road thanks to Crown parts. 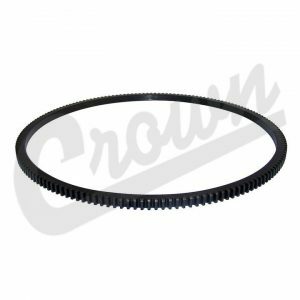 Crown Automotive also offers an exclusive line of component kits and accessory products. Fits Jeep CJ (1978-1986) with Power Brakes. Jeep CJ-3B (1957-1968) w/ 12-volt electrical system. Jeep CJ-5 (1957-1966) w/ 12-volt electrical system. Jeep CJ-6 (1957-1966) w/ 12-volt electrical system. Jeep Pickup (1957-1965) w/ 12-volt electrical system. Jeep FC-150 (1957-1964) w/ 12-volt electrical system. Jeep FC-170 (1957-1964) w/ 12-volt electrical system. Jeep C101 Commando (1966) w/ 12-volt electrical system. Not only can your Jeep stand out from the crowd with this eye-catching Stainless Steel Hood Set from Kentrol, but it also can have a lifetime of rust-free looks and a fit that is guaranteed on your CJ or YJ Wrangler. This Kentrol Hood Set is made from mirror finished T-304 stainless steel which is stamped, drilled, machined and welded to achieve performance perfection as well as a beautiful fit. The hinges and hood vents are even slightly oversized to precisely cover any pain seams or exposed body primer when installed. Even the mounting hardware is high quality stainless steel so you know what you buy is is the highest quality around and the ultimate in durability. It’s time to replace your old cracked and worn dash pad with Omix-ADA’s factory style CJ dash pads. Our units update the whole look of your Jeep’s interior even especially on models not equipped with a factory-padded dash. Our dash pads are exact replicas of the originals to offer the best fit, form, and function. Id never seen one in Light Grey until this week, the finish is nice its brand new NOS> the white Jeep Logo on the dash pad has stil got its protective sticky paper on it. Its very tidy A1 condition. Custom Dash Plate Panel 3mm alloy plate, designed and built without several cutout. A rare find in excellent condition is this front drive shaft from a CJ10 Jeep. Painted in AMC Blue the front shaft measures 29.5″ outside to outside. Greasable uni joint one end and double cardinal the other you couldnt find a better shaft on the market today. Hardly used this part would compliment any restoration project or daily driver. Boxed the shaft will weigh 6.5kg with a box size of 75cm long, x10cm x 10cm. Designed to fit in front or rear upper control arm mounts.